The Sun River Loop Scenic Byway is a spectacular forty-six mile drive that provides sweeping views of the Rocky Mountain Front and the adjoining prairie. Unlike many scenic drives in Montana, the Sun River Loop Scenic Byway is, as the name suggests, a loop drive. The route begins, and ends, in the small town of Augusta. Highlights of the Sun River Loop Scenic Byway include the scenic Nilan Reservoir, unsurpassed views of the Rocky Mountain Front, driving through the first layer of forested mountains along the Rocky Mountain Front, and an enjoyable drive through the heart of the Montana grass prairie. Additionally, a short-side trip is also available that leads to Gibson Dam and Gibson Reservoir. The drive begins in the quintessential Western town of Augusta. To begin, just head south of town about a mile on Highway 435 and look for signs pointing toward Nilan Reservoir or Benchmark. On a map, the road is named the Augusta Ranger Station Road, although I never once saw a road sign that said that (so be warned). The road itself is gravel. However, the road is wide, has little traffic and is, during normal weather, in excellent condition. Almost immediately, the road offers unsurpassed views of the towering peaks of the Rocky Mountain Front that rise abruptly off the prairie floor. The mountains of the Rocky Mountain Front extend off to the north and south to the horizon. After five miles, the road passes Nilan Reservoir, a small reservoir that has solid fishing for trout. A small but very scenic campground is also located on the reservoir. Beyond Nilan Reservoir, the road begins to roam through upland prairie. 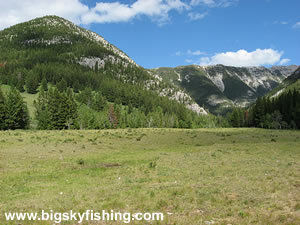 Excellent views of both the Rocky Mountains as well as the seemingly endless march of the Montana prairie abound. After sixteen miles, the road reaches a junction with the Benchmark Road that heads to the south and makes for a beautiful side-trip of its own. From here, the Sun River Loop Scenic Byway changes character. The drive soon begins a very steep ascent up a rather narrow gravel road as it enters the mountains. Almost immediately, the open vistas give way to forest as the road begins to travel north behind the western edge of the Rocky Mountain Front. The forested portion of the Sun River Loop Scenic Byway is short, no more than 10 or so miles. However, the road is rather narrow and is quite twisty. Although the forest is thick in this part of the drive (helped by the higher elevation and its location away from the rain shadow cast by the Rocky Mountain Front), there are enough openings in the canopy to provide some wonderful views. After twenty-seven miles, the scenic drive reaches the Sun River Road near Gibson Dam. Several developed campgrounds are located here, and many attractive primitive camping spots are available. For those wanting a unique and scenic view, be sure to take the short side-trip up to Gibson Reservoir. From the junction with the Sun River Road, the road widens and is usually in very good condition. For the first few miles, the road closely follows the Sun River. Then as the road enters the Montana prairie, the drive begins a very scenic trip through the heart of the Montana grass prairie. The views are spectacular, sweeping and seemingly never-ending. A popular fishing and camping spot is located along this stretch of road at Willow Creek Reservoir. 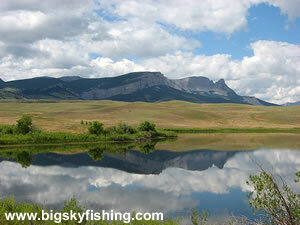 Willow Creek Reservoir has fine trout fishing in a very scenic setting. Both developed and primitive camping spots are available on the reservoir. 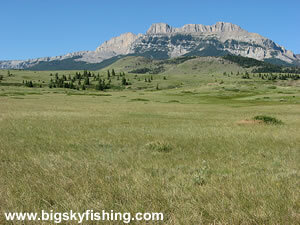 Additionally, to the south of the road lies the Sun River Wildlife Management Area (WMA). The Sun River WMA is a refuge for elk and other wildlife. The access road into the Sun River WMA is also a very beautiful drive and which I consider scenic. Visitors taking the Sun River Loop Scenic Byway should consider taking the short scenic drive on the Sun River Wildlife Area Byway. Overall, the Sun River Loop Scenic Byway should be high on anybody’s list of scenic drives in Montana. The views of the Rocky Mountain Front are unsurpassed. Anyone who enjoys the views provided by the contrast between the prairie and the sharp ascent of towering mountains will greatly enjoy this scenic Montana drive. Highlights : Sweeping Views of the Rocky Mountain Front and the adjoining prairie, Nilan Reservoir, Remote Mountain Drive, Gibson Dam, the Sun River. Road Type : Primarily Gravel. A few miles of the road is paved. The gravel portion of the road is usually in excellent condition. The portion of the road in-between Gibson Dam and Benchmark can be a bit more iffy, depending on the weather. 2wd vehicles should stay off this portion of the road when the roads are wet/muddy. Nearby Towns : Augusta, Choteau. 4wd needed? : No, except in spots when the road is very wet. Season : Parts of the drive are open year round, weather permitting. The western part of the drive that skirts behind the Rocky Mountain Front between Benchmark Road and Gibson Dam is closed during the winter. The map below shows the route and location of the Sun River Loop Byway and other nearby scenic drives. The Sun River Loop Scenic Byway is located outside of Augusta, Montana. Bring your tent, camper or RV, as there are no services of any kind located along the drive. For in-town lodging, a small hotel "might" exist in Augusta, but I have no idea of what it's hours are (many small hotels in Montana are seasonable). Developed campgrounds are common along the drive and are located at Nilan Reservoir, Gibson Dam, along the Sun River near Gibson Dam and at Willow Creek Reservoir. Primitive camping is also available along long stretches of the drive, as the drive passes through extensive holdings of federal land. Hotels are somewhat sparse. Choteau and Augusta have a handful of hotels. Great Falls offers the most options, but is about an hour+ away.